The 6-Outlet Power Strip from Belkin allows equipment to be plugged in at point of use. Featuring a 12 ft length, the Power Strip provides enough reach to get to available receptacles. 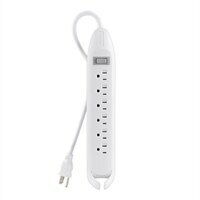 Belkin Inc 6-Outlet Power Strip Cord - 12 ftThe 6-Outlet Power Strip from Belkin allows equipment to be plugged in at point of use. Featuring a 12 ft length, the Power Strip provides enough reach to get to available receptacles.